I like spring a lot because I love warm weather and flowers too. The Tulips and Cherry Blossoms are always in my “Spring Bucket List ” every year. Even I go to see them each year. Today I am going to share my experience of visiting Tulip Farm in Skagit Valley. Let me tell you “Tulip Festival in Skagit Valley” was the first time I had seen the tulips in person. I have always heard about it and seen pictures on the Internet but never got a chance to see it with my own eyes. Hence, you can imagine how excited I was? Before I planned my visit I searched about Skagit Valley Tulip Festival and found out that it was officially inaugurated in 1984. 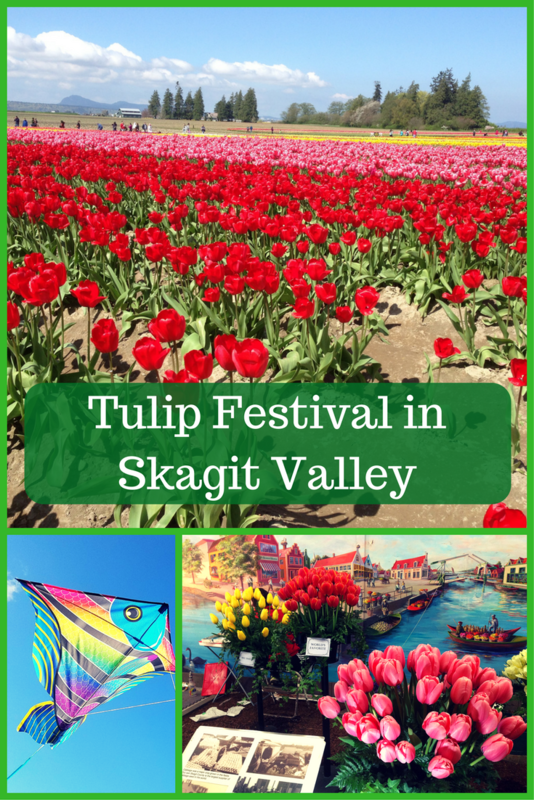 The Skagit Valley Tulip Festival is one of the best Tulip festivals in the Pacific Northwest. Every year it held in April. The full bloom of Tulips varies according to mother nature. Tulips are scattered all across the Skagit Valley. There are two big farms which are famous for there Tulips. The Roozen Gaarde and Tulip Town where you can see millions of Tulips with a number of different colors. I would suggest you plan your visit in 2nd and 3rd week of April, as major Tulip blooms in midweek of the month. If you are visiting with toddlers then bring the stroller, It will be much easy to roam around the farm. once you are out on the farm field you will not get anything so better to keep water and snacks with you. Check weather predictions before you plan so that you can get your spring gears accordingly. As you are visiting the farm there will be dirt, no concrete floors, so choose your shoes wisely. One of my friends suggested me this place to see Tulips and we planned this trip. I would suggest checking full bloom report before you plan your visit. Generally, in first-week Tulips are still growing and doesn’t come to full bloom stage. Same in last week it almost or about to die. Hence, the best time to see full bloom Tulips is 2nd and 3rd week. However, it totally depends on mother nature and things can change accordingly. Let me tell you I didn’t imagine that it has such a huge display. It is almost 1 hour 30 mins drive from Seattle, so better to start early. We started around 8 am, but there was a bumper to bumper traffic and it took little more than 2 hours to reach there. Each Farm has parking facility but you will found it crowded and hustle finding the parking spot. You will find so many people around Tulip farms. We have also spotted small Tulip patches on the way to the town. We went to Tulip Town if you want you can also visit more than one farm. You have to buy a ticket in order to visit the farm and tickets range from $5 to $10, it depends on when you are visiting. All farms will provide parking facility. The Tulip town had a small indoor display with different colors of Tulip flower and a little history behind it. They have a big windmill in display and in a farm as well. They also set up a booth for face painting and kids loved it. There is also Tulip pot shop from where you can buy Tulip pots and grow in your garden. If you are not a good gardener then buy Tulip art or some souvenir from the shop. They also have food stall to quench your hunger. You can also buy a kite from there and enjoy kite flying. Except viewing Tulips there are other things to spend time with like Trolley Tour, Kite flying, and picnic. I was totally amazed by the variety of colors. I had never imagined finding any flower with more than ten colors. Even we had seen Tulips which has two shades in single Tulip flower.